home | writings | Thickest Part of the Thigh, Huh? Thickest Part of the Thigh, Huh? What happened was the bird was done an hour before it was supposed to be. Luckily, the guests had already arrived. I made some excuse about setting the timer incorrectly and corralled everyone into the dining room before they even had a chance to enjoy a glass of wine and my homemade cheese straws bow ties. Then, when I carved the breast (thankfully in the kitchen), it was like watching a scene from Saw V–bloody hell. Apparently in my haste, I had pushed the digital thermometer into the thickest part of the thigh and right on through the other side and into the bird’s unstuffed cavity. There, the probe became superheated super-fast, not giving the turkey enough time to roast properly. So I shooed everyone back into the living room (except Matty), and we reassembled the bird, stuck it back in a slow oven, then all of us had to make that one bowl of cheese straw bow ties and some roasted Marcona almonds last an hour. My problem was: How to tell where the thickest part of the thigh was so I could jab a thermometer into it. It seems like a no-brainer, but without an arthroscopic camera attached at the end of my thermometer’s probe, I was lost. Then I discovered an absolutely surefire way of hitting that sweet spot every time, and my birds have been perfectly cooked ever since. First, roast your turkey whichever method suits you. To take its temperature, remove the beast from the oven after 30 minutes and stick the thermometer into the thigh. I use an ovenproof digital thermometer with an alarm so I can monitor the temperature during cooking. Now, jab around in there, you’ll see the temperature rise and fall. Find the coldest spot. That’s where the least amount of heat has penetrated and therefore it’s the thickest section. Leave the thermometer where it is, slide the bird back in the oven, and wait until the desired temperature is reached. I go with 165 degrees. I feel comfortable with that. For the longest time the USDA said 180 to 185 degrees was the proper thigh temperature, and the result was a bird that was chokingly dry. But in 2006, the department mercifully revised its temperature rules, which means we all have a chance for a better, juicier turkey. Of course, they still demand a high 160 degrees for medium pork, but I never go above 150, and, hey, I’m still here. But that’s another story best left for a different holiday. Originally published November 9, 2008. 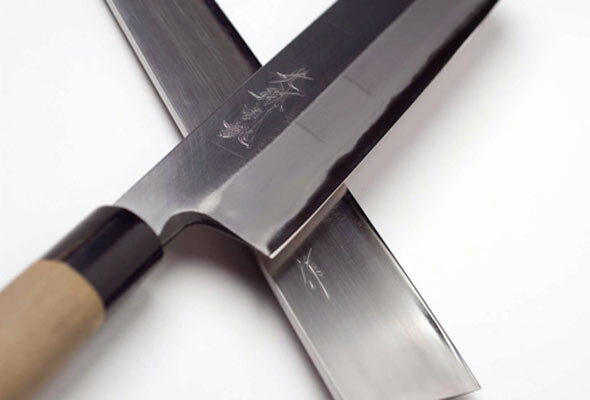 So You Wanna Buy a Knife, Huh? Great post. I’ve always found that “thickest part of the thigh” language so mysterious. What the heck does that mean? Exactly so why, why would he post a picture of a thermometer? Post a picture of one in the bird, damm it!!! So we can all see where the thigh is, that is why we came here. Not to see a pic of a thermometer. Bob, since I am the “he” in question, I will answer with a question: Why, oh, why would you not read the comments!! (A picture of the exact spot that I use is on a comment dated Dec. 24, 2010–12 comments above this one.) I hope this helps. Okay—we’re hosting Thanksgiving at our house this year, which means I’m cooking a whole turkey for the first time (and I know it’s not “just like roasting a chicken”). I’m going to give your method a try, but I’m also going to place all blame completely on you if we end up eating the ham instead. Leanne, um, well, that’s a lot of pressure. But it did work for me. 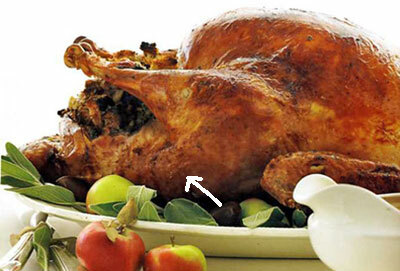 Why not check out the video: How to Tell When Your Thanksgiving Turkey is Done? That can help, too. Why can’t someone just point to the thigh and take a picture. Where the heck is the thigh? Got the breasts, got the drumsticks, know where the backbone is, neck is in the garbage pail. Where is the thigh? Curtiss, here is your Christmas wish! Thanks David! Good information. My bird is in the oven and family is gaily talking family history while I worry. My temp prob went in through the skin between the drumstick and the breast pointed down toward the tail. I think through the thigh. I warmed up the turkey and found the coolest part thirty minutes after putting the bird in the oven, by slowly sticking the prob in the bird and watching the temp. I’m at 127. Curtiss, stick with it, my friend. You’ll be fine. You’ve done everything right, so I expect it will great. Let us know how it turns out. They love it! The turkey is a success! Thanks for all your help! Huzzah, huzzah, Curtiss! I’m so glad we could be of help. Wishing you and yours a warm, wonderful holiday and a peaceful and tasty 2011. Ah, turkey roasting! I’m afraid I follow one of those arcane rituals involving brown paper grocery bags (learned from my grandmother) and searing temps, until I lower it to something more normal. Do not use a clock or timer, just my sniffer to tell me it’s just about time, and the old poke a knife between the leg and the body to see if the juice runs pink or not. It’s always been done when everything else was ready. Like I said, arcane. Don’t know how or why, but it’s always worked for me. Leave the protein portion to them what enjoys the gig. You do the orgasmically delicious desserts that very few can master. ruthie, that means you are a born roaster. And they’re far and few between. My mom is one and can smell when a roast is done–even from the basement! The best thing about Thanksgiving for me is indeed the dessert. Well, that and the stuffing. And the mashed potatoes. And, well, the gravy. In fact, my least favorite part of Thanksgiving is the turkey. Hmmmm. That’s because you harbor hidden resentment, secretly blaming it for your roasting…um…comeuppances. LOL! I know what you mean about loving the whole deal, though. I have to do turkey at least two or three times a year. It’s the only way to avoid that turkey coma and the accompanying discomfort at Thanksgiving. When I know I don’t have to wait another year for my fix, I can control myself. So few people, me included, make turkey only once a year. I was speaking to several Brits and Canadians when The One and I were on a cruise recently, and they make whole turkeys all the time. We should take a page from their cookbook…so to speak. U ARE MY HERO…. I think…. let u know after I cook my $ heritage birdy. pa lo, now you’ve got me nervous! Those bird are quite expensive. Please do let me know, and Happy Thanksgiving. Can you tell me what brand of ovenproof digital themometer with an alarm did you use to test the turkey. Jackie, the brand I have is CHEFS, but it’s no longer being made. 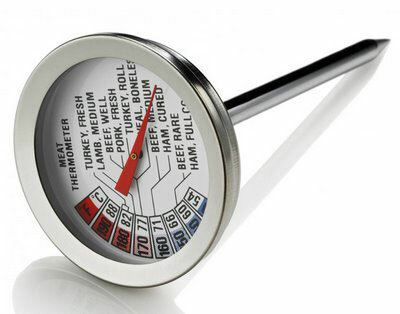 It’s similar to this thermometer. Now, I’m not recommending this one, as I haven’t tried it, but the reviews look good. The thermometer shown, like its more expensive Thermapen version, is NOT oven-safe. gloria, you’re correct. But the method I discuss is simply taking the temperature of the turkey then sliding fit back in. It’s not meant to stay in the oven while the turkey roasts. I have hosted Thanksgiving for thirty years…that means, of course, thirty turkeys that I never enjoy eating. I have tried just as many suggestions with varying results, though everyone feels compelled to say that every turkey was delicious. I would have welcomed your suggestions this year, however, I’m making a filet of beef instead! Happy Thanksgiving! Angela, why don’t you like your turkeys? My dad doesn’t like turkey at all, so we always had either capon, ham, or a beef roast.